Thorne & Derrick distribute 3M Cold Shrink Cable Joints suitable for jointing, connecting and splicing medium and high voltage (MV-HV) cables including 11kV, 33kV, 66kV and 132kV – we provide competitive prices for cold shrink cable joints from extensive stocks to UK and international destinations. Using cold shrink cable joints reduces the risk of cable jointer error or causing damage to the insulation of the MV-HV cable and ensure a constant radial pressure is applied to the cable for the duration of the cable joints life. All 3M cold shrink cable joints include built in components to ensure either good insulation, stress control or adequate earth potential over the screens. 3M cold shrink cable joints are available in a standard cost-effective range or premium options. 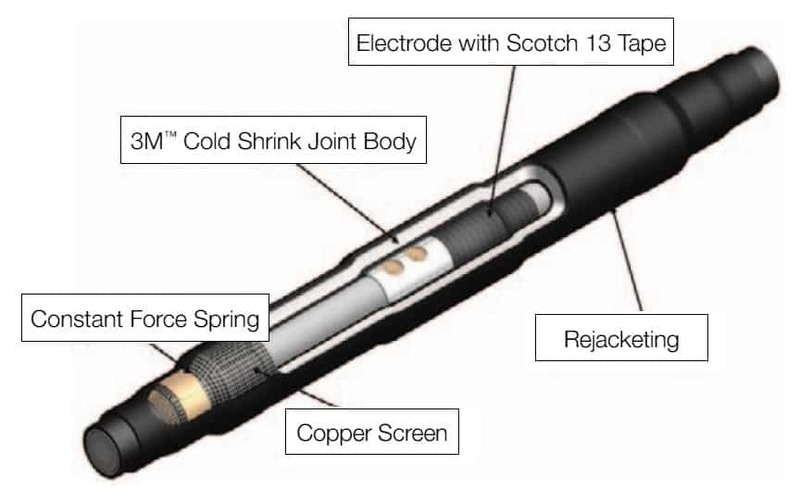 The standard range covers many of the most common cable configurations and size ranges unique to the UK market but requires the electrode to be built up by the cable jointer using Scotch 13 electrical semi-conductive tape. 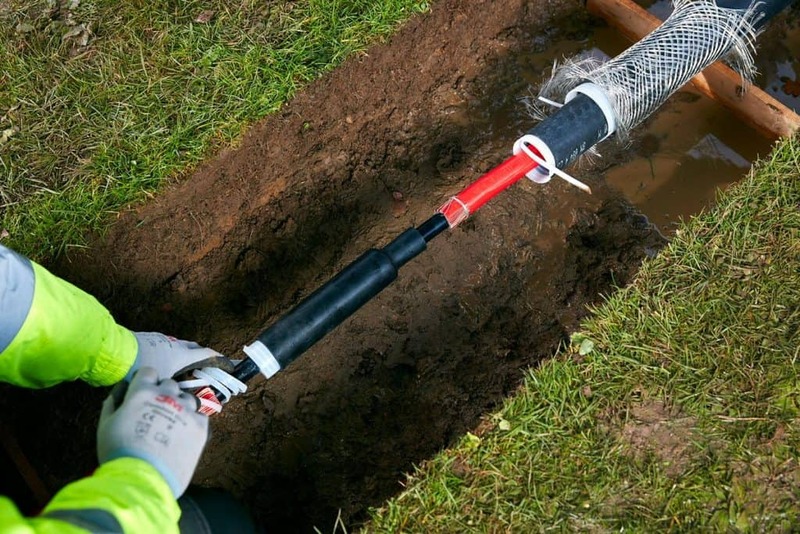 The premium 3M cold shrink cable joint range comes with an integrated semi-conductive electrode removing the need for the jointer to use tape and is available for almost any cable configuration and size up to 72kV. Also available is the Super Premium cold shrink range which is a pre-assembled cable joint comprised of a one piece joint body, copper screen sleeve and outer protection. The fully integrated pre-mounted cable jointing solution reduces process steps ensuring a quick and safe installation. 1. 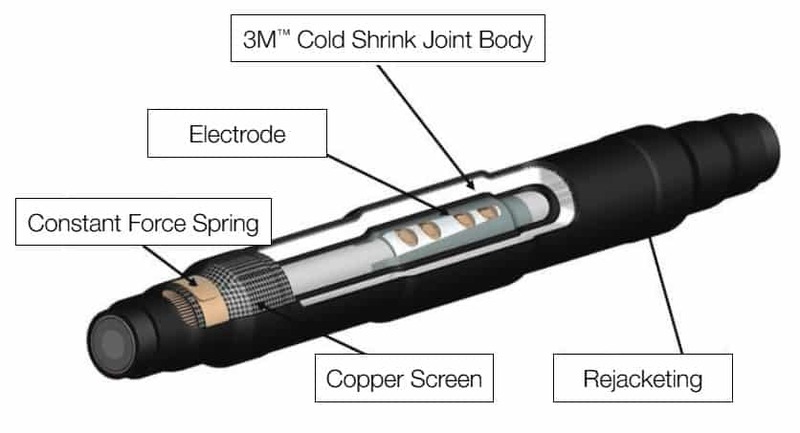 Park the 3M Cold Shrink splice body onto the prepared cable, connect the cores and clean thoroughly. 2. Thoroughly grease the connected cable in preparation for the splice body. 3. Once in position, begin to remove the inner coil from the joint body. 4. For extra peace of mind, take advantage of the fact that splice body position is easily checked. 5. Place the earth stocking over the splice body. Ground and secure with 3M Constant Force Springs. 6. Insulate the constant force springs with Scotch 23 Rubber Splicing Tape and then overlay with Scotch Rubber Mastic Tape 2228. 7. Position the pre-parked 3M Cold Shrink Outer Protection Tube over the stocking and begining to remove the inner supporting core. 8. Continue to remove the inner core until the outer tube is fully shrink, completing the cable joint. Also: 3M Cold Shrink Cable Terminations for medium and high voltage 11kV 33kV 66kV cables terminating.